Threads of Inspiration: Largest Textile Garage Sale in the World! 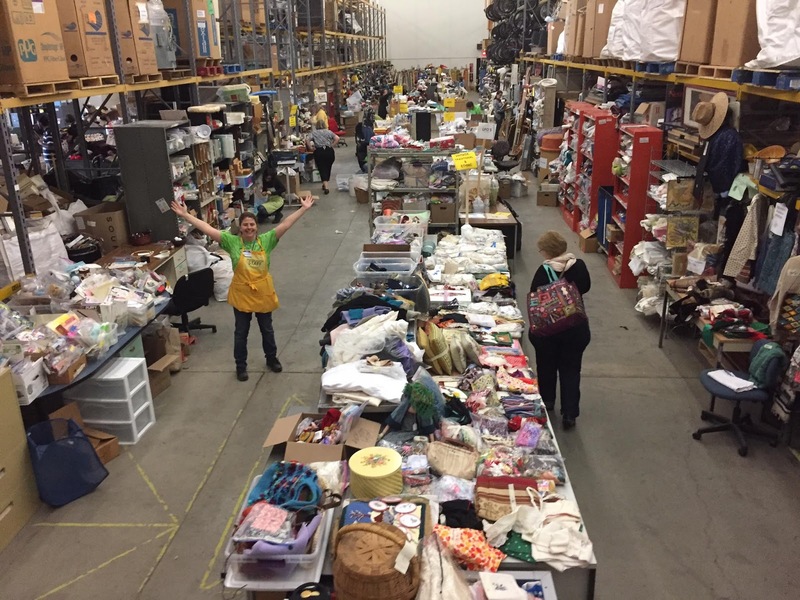 Largest Textile Garage Sale in the World! 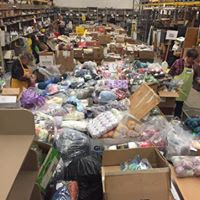 I know I have posted about the Textile Center of Minnesota's Garage Sale, which they have billed the world's largest and I suspect they are correct. The sale was this past weekend and of course I joined in the festivities! I've always wanted to volunteer to help before the sale but in the past I have had conflicts. Not this year though, so I sorted and priced needlework. The sheer volume of stuff that comes in is incredible and it's hard to believe that it all gets sorted, priced and displayed in two days. 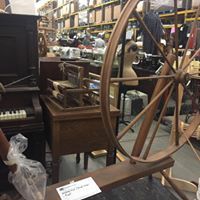 A great wheel ready for a new owner. As you can see in the first photo, I scored some yarn - there's a scarf pattern I want to make and why make one when there are two beautiful yarns to use? Check out the pattern on Ravelry. I also was drawn to fabric for a summer blue daisy dress, pink and black flowered fabric for a skirt and some funky neon geometry for a bag. Plus a few pieces of embroidery linen, and some great Vineyard merino wool for crewel. Plus a few odds and ends to make some samples for a class I'm going to teach, oh and sock yarn. But the thing I'm most excited about is this fanny frame. 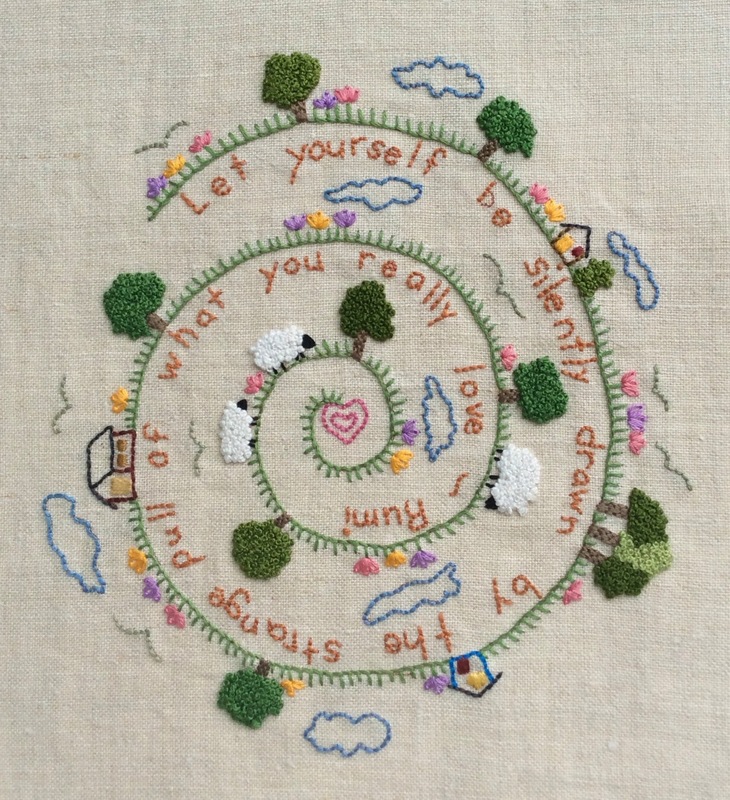 You put your needlework in the hoop and then you sit on it. That way both hands are free for working which is a big deal for me. I'm trying to think of one exclamatory word to describe the experience but I need more....fun, amazing, overwhelming, wonderful, creative.....I'll leave it at that. If you are in the area next April be sure to check it out!!!! Oh wow - talk about a needleworkers heaven on earth! Looks like you scored some real treasures. I think I would have been so overwhelmed with the sheer volume of goodies on display and would have wanted to bring it all home!